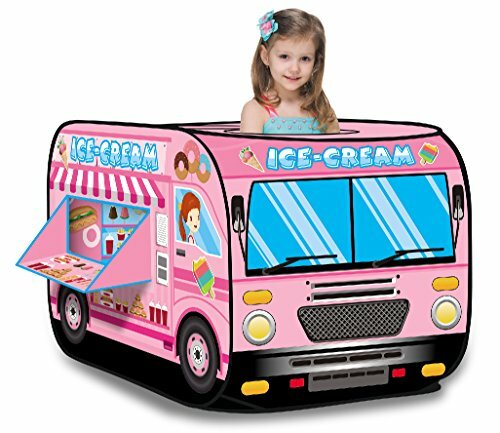 Let your children spend long creative hours in this adorable Ice Cream Truck tent. The flexible supports inside this play tent make setup tool-less and extremely easy. Made of polyester non-woven fabric material, the play tent is durable, strong, and easy to clean. It can be built up easily with simple twists and pop-ups, or folded down to inch flat. Features one opening flap for easy entry or exit, and 2 top openings. In this large Ice Cream Truck Play Tent you can fit up to 4 kids at once! Children can play with their toys inside, play hide and seek, or use it as a ball pit. Structure measures 45"(L)X28"(W)X28"(H). Suitable for outdoor and indoor use. Structure Measures 45"(L)X28"(W)X28"(H); Suitable for Outdoor and Indoor Use.